THE CREEPSHOW – What doesn’t kill you only makes you stronger! 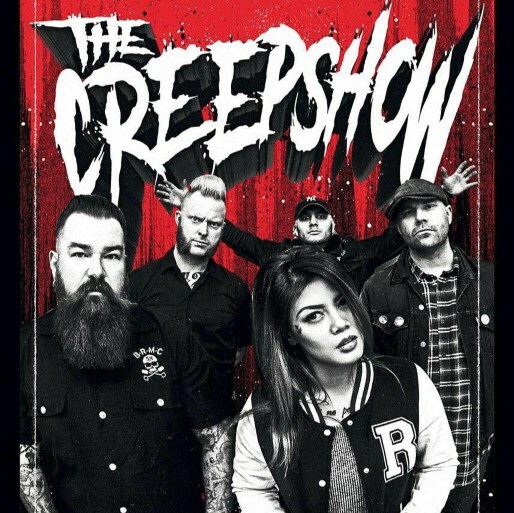 For the past 12+ years The Creepshow from Montreal, Canada, have been smashing the whole damn world in the face with their brutaltasticmélange of punk, country, psychobilly and good old-fashioned rock n’ roll. With the debut of their first album “Sell Your Soul” in 2006, The Creepshow was immediately catapulted to the forefront of the bourgeoning international psychobilly/punk scene and opened the door for them to bring their eye and ear scorching live show to the four corners of the earth. The release of “Run For Your Life” (2008 Epitaph/Stomp), “They All Fall Down” (2010 Epitaph/Stomp) and “Life After Death” (2013 Stomp/Sailors Grave) further cemented the band as one of the most impressive, critically acclaimed and well-respected touring acts out there. Which brings us to their most recent epic release “Death At My Door”. Ten tracks of raging, bloodcurdling and raucously rebellious fury showcase the very best from this roadharderned group of beautiful misfits. The haunting vocal stylings of Kenda Legaspi soar seamlessly over Chuck Coles’ buzzsaw sharp guitar lines and the ragtime gospel organs/keys of the Reverend McGinty; all the while held together by the hard-driving stand-up double-bass slapping rhythms of Sean McNab and the impossibly violent percussive assault of Sandro Sanchioni on drums. If you’ve been lucky enough to catch them when they played on Last Gang’s stage at Boomtown Fair you know you’re in for a wild ride, so don’t miss their Cambridge debut! HEADSTONE HORRORS – Headstone Horrors are a fast paced horror band from Nottingham who bring their own brand of street punk to the horror genre. If you like your punk rock bloody, fast and fresh out the grave then you’d be mad to miss them! LAST GANG IN TOWN DJs – Punk & beyond….